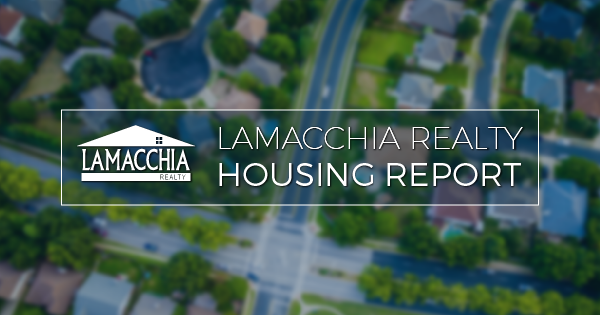 The Lamacchia Housing Report presents overall home sale statistics and highlights the average sale prices for single families, condominiums, and multi-family homes in Massachusetts and Southern New Hampshire for December 2018 compared to December 2017. It also looks at other metrics in Massachusetts like Homes Listed for Sale, Homes Pending, and Price Adjustments made to active listings, as they are often the best indicators for predicting future trends in the market. After the slowest fall since 2014, it was not surprising to see that sales were down so much in December. The number of homes sold was down and the average price was up in December 2018 compared to December 2017 as you can see in the graphic below. Sales were down for condos, single families, and multi-families, and prices were up in all three categories. Prices have continued to rise in average price despite the decrease in home sales. They are up 4.56% coming in at $437,615 from $418,541 last December. 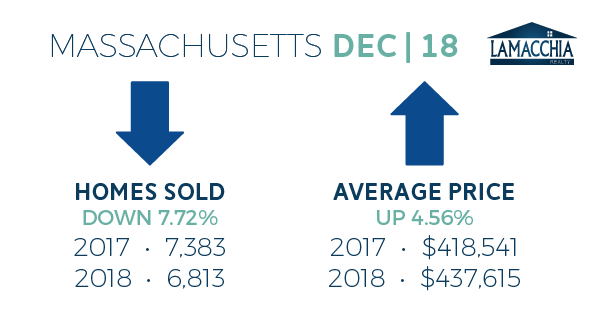 There were 216 price adjustments in Massachusetts in December, compared to 206 in December 2017. This 4.85% increase is likely due to sellers who were a bit overconfident in the beginning and listed too high which limited the interest, re-evaluating their sale price and correcting it to a more targeted market value for the winter. The number of homes listed in December was up over last year by .95%, with 3,492 put on the market compared to 3,459 in 2017. This speaks to the blog we released earlier in winter about how homes DO sell during the holidays. Sellers know to take advantage of the fact that buyers out looking during the time between Thanksgiving and New Years are serious and ready to make offers. Pending home sales were down by 2.29%, with 4,905 put under agreement compared to 5,020. Not a large percentage decrease, but still speaks to the fact that pricing right this winter is essential, and overinflating a list price based on the summer market will make a home sit for longer, which Anthony explained in his 2019 Predictions. 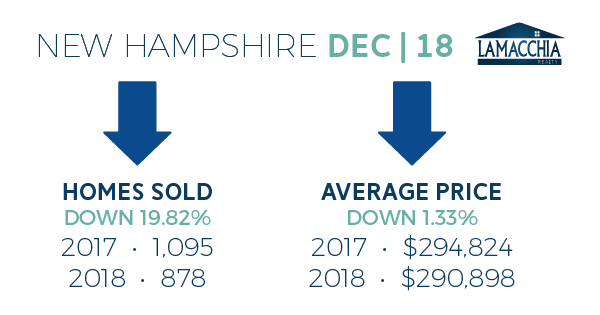 New Hampshire experienced decreases in sales and prices in December 2018 compared to December 2017. Sales were down by almost 20% for condos, single families, and multi-families. Prices, though down only slightly, were down in condos and singles, but were up in multi-family homes. Prices in Southern New Hampshire decreased by 1.33%, with December 2018 closing in at $290,898 from $294,824 in November 2017. Prices increased in all three categories, with multi-families increasing by an astounding 50.68% coming in at $557,663 from last year’s $370,089. Single-family prices increased by 11.05% moving from $315,600 to $350,460, and condos increased by 4.22% now at $268,556 from $257,690. The deep freeze cooled the market down in December, but now that the holidays are over and we are fully into the first month of 2019, we are seeing things start to heat back up. Interest rates dipping at the beginning of the year helped get buyers out. With inventory higher than a year ago at this time, buyers do have an opportunity to score a deal before the spring rush. Sellers still need to be realistic about the list price of their homes to attract the right prospective buyers. Sellers need to be staging and prepping their homes for a winter sale so that buyers feel warm and excited about the home enough to make an offer. Buyers should be excited as inventory has been steadily increasing over the past couple of weeks. This is a bit of a sweet spot where the bidding wars haven’t fully hit their stride, so serious buyers should make offers as soon as they feel ready in order to beat the competition late winter and early spring rush that we see every year when bidding wars peak.